During the final decades of life on Mars, called Maleca'andra by its inhabitants, Green Martian offspring were created as an act of will by parents giving of their own biomass to produce heirs within the confines of environmental allowance. Perhaps for this reason, twins were rarely born, marking brothers Ma'alefa'ak and J'Onn as exceptional from birth. In the Martian language, Ma'alefa'ak meant "Darkness in the Heart," so named based on a dire vision of the future his precognitive mother witnessed. Ma'alefa'ak was considered cursed from the beginning, a loner with a reputation for being difficult who saw himself as a freak. Ma'alefa'ak only ever felt love from his brother J'Onn, whom he resented for seemingly having been given all of the best possible traits, and himself only the worst. While technically a twin, even in adolescence Ma'alefa'ak's posture and expressions easily differentiated him, as well as his prominently pointed ears. During these years, the brothers underwent the ritual of G'amal'khul, in which they permanently exchanged a portion of their psyches with one another. Although slow in developing, Ma'alefa'ak eventually gained his full inborn telepathic abilities. As Ma'alefa'ak aged, he came to question the most basic tenants of Martian life, such as dismissing the ethics of the telepathy protocols when he knew that he possessed the ability to pierce any given mind at will. Ma'alefa'ak chose theology and quantum physics as his life path into adulthood, barricading himself for long periods in his solitary laboratory. Ma'alefa'ak's isolation, seeming neglect of theology, and resistance to even the gentlest inquiry brought him to the attention of the Ruling Council. Ma'alefa'ak explained that he was seeking to fuse theology with physics, either to wake up the unresponsive native deities of Mars, or to seek out new gods. The council branded this as blasphemy, but Ma'alefa'ak had only consented to inquiry because he had already completed his experiment, presenting Glorious Godfrey of Apokolips via Boom Tube. While seemingly benevolent, the New Gods of Apokolips slowly insinuated themselves into Martian life. 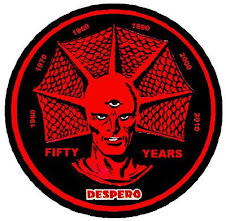 Through the association, the forces of Apokolips learned and exploited Mars' vulnerabilities in a terror raid, and kidnapped a number of its citizens before being driven back. Among those taken were Ma'alefa'ak and his father M'Yrnn, although the degree of Ma'al's willingness was left unclear. J'Onn J'Onzz was soon brought to Apokolips by the neutral New God Metron to extract his people, but by the time he reached his father, M'Yrnn's mind had been permanently severed from his body. 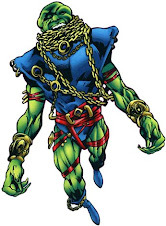 Both M'Yrnn and Ma'alefa'ak had been subjected to the abhorrent experimentation of the sadistic DeSaad, and the disembodied mind of M'Yrnn made J'Onn promise to help Ma'alefa'ak as best he could. Ma'alefa'ak's mind and spirit had apparently been thoroughly broken, and upon his return to Mars, native healers were unable to comfort him in any appreciable way. Ma'alefa'ak claimed to feel extraordinary pain under any significant telepathic probing. However, Ma'alefa'ak was still devoted to the Lord of Apokolips called Darkseid and the pursuit of the Anti-Life Equation, so the truth of the matter is ambiguous. While posing as helpless and fragile, Ma'alefa'ak became a psychic predator, committing a spree of mind rapes the likes of which had not been seen on Mars in a century. Although J'Onn's new wife My'ria'h was one victim, J'Onzz refused to indict his brother without proof. Ma'alefa'ak's mother Sha'Sheen needed no such convincing, and when she confronted Ma'al with his crimes, the young man destroyed her mind. Upon her assisted death shortly thereafter, Sha'Sheen's psyche briefly manifested to positively identify Ma'alefa'ak as her attacker. Ma'alefa'ak stole a spacecraft and flew to an abandoned White Martian lab hidden on Venus. 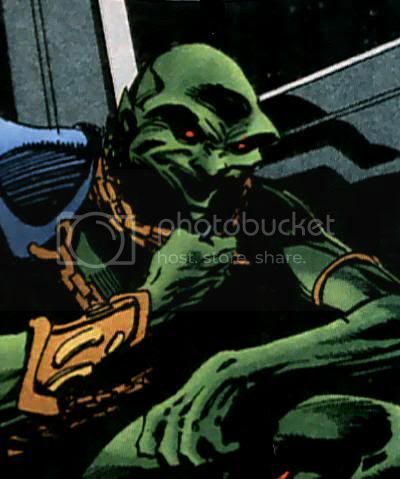 J'Onn J'Onzz tracked the vessel and braved Ma'alefa'ak's repeated murder attempts. 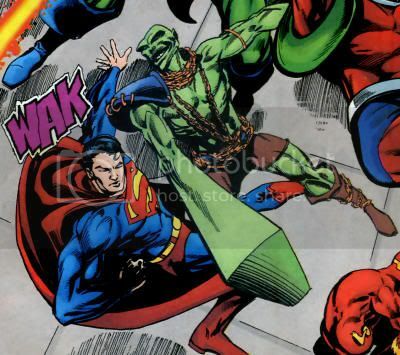 Ma'alefa'ak engaged J'Onn in psychic combat, but was not his brother's equal on this plane, and was defeated. J'Onn offered to meld with Ma'alefa'ak, giving his brother some of his personal "light" and take on some of Ma'al's "darkness" to achieve balance. Ma'alefa'ak refused, and was subsequently returned to Mars for trial. Ma'alefa'ak was sentenced to be stripped of his memories and telepathic powers. Ma'alefa'ak pleaded to Darkseid, with whom he maintained a psychic connection, but was refused clemency on account of his failure. Trapped within a jewel-like cell, a chorus of Martian minds, including his brother's, burned through the psyche of Ma'alefa'ak. Although he had begun a new life as priest/scientist of the geothermal Central Power Cathedral located within the volcano dubbed "Olympic Mons," Ma'alefa'ak continued to feel the hatred and mistrust of his fellow Martians. Due to his lack of telepathy and contact with the communal "Great Voice," Ma'alefa'ak was more isolated and twisted than ever. Ma'alefa'ak devised an artificial plague dubbed "H'ronmeer's Curse" which would infect his fellow Martians psychically and cause them to spontaneously combust. Thanks to the delivery method, Ma'alefa'ak's mind was functionally immune to the plague that he unleashed. Ma'alefa'ak was again the first and most obvious suspect in crafting the plague as it slowly advanced through Martian society. Brought to inquiry, J'Onn J'Onzz once again defended his brother as the Father of the Elders called for Ma'alefa'ak's execution. J'Onn was charged with finding out the truth, but time was not on the side of the whole society. Upon direct questioning, Ma'alefa'ak didn't make the slightest attempt to conceal his involvement, then attacked his twin. Ma'alefa'ak affirmed that there was no cure, and pronounced that all would die while he sat protected within a fortress of fire. Surviving the deaths of his wife, child, and every other Martian he encountered, J'Onn J'Onzz flew through the wall of flames surrounding the Central Power Cathedral in a bid to finally end the life of his deviant brother. Their ensuing battle smashed the ducts controlling the flow of lava within the station, leaving Ma'alefa'ak presumed dead and buried under the wreckage. However, Ma'alefa'ak survived, living for years under the same assumption about his brother. Only later, when J'Onn J'Onzz visited Mars after having relocated to Earth and acted for decades as the super-heroic Martian Manhunter, did Ma'alefa'ak learn the truth. Using his established knowledge of abandoned White Martian technology, Ma'alefa'ak teleported from Mars to the ancient, infamous base Z'Onn Z'Orr, recently uncovered by The Hyperclan. 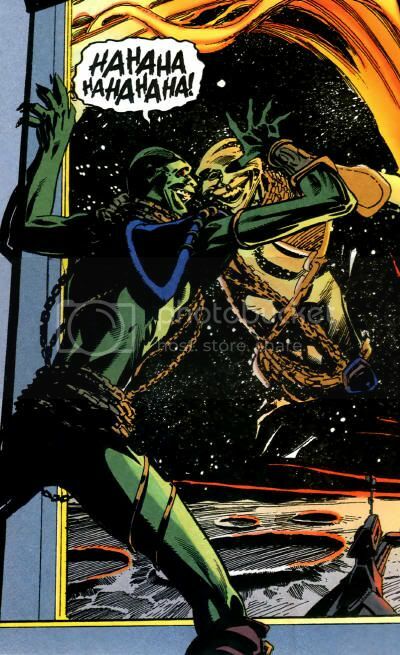 From there, Ma'alefa'ak systematically tortured J'Onn J'Onzz's Saturnian charge Jemm while appearing to be his brother. Ma'alefa'ak next assuming J'Onn's human identity of private investigator John Jones, then murdered his partner Karen Smith. Each of these actions were meant to discredit and frame his brother amongst any associates that might otherwise assist him. 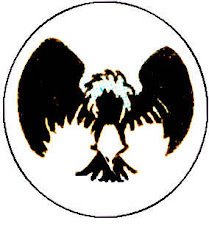 Ma'alefa'ak allowed Jemm to escape and triggered an emergency signal to the JLA Watchtower. An investigative team teleported to Z'Onn Z'Orr, and were forced to relive Jemm's torture telepathically. While Wonder Woman carried Jemm to safety, the heroes Aquaman, the Huntress and Steel were teleported to Mars. There, still in the guise of J'Onn J'Onzz, Ma'alefa'ak exposed the heroes to horrific experiments that he had been conducting and convinced them that the Martian Manhunter had been performing such atrocities since his arrival on Earth. The false Manhunter attacked and threatened to kill J'Onn's teammates before allowing them to escape, hoping to destroy his brother's good name before murdering him. 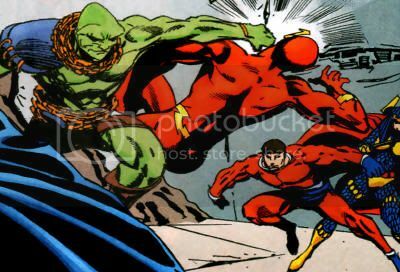 When the Justice League gathered to confront the Martian Manhunter at the Watchtower, Ma'alefa'ak invisibly attacked its members, forcing both Martians to battle the eight present JLAers. Ma'alefa'ak dealt serious damage to Steel, the Flash, and Superman before J'Onn decided it best to escape the scene entirely. 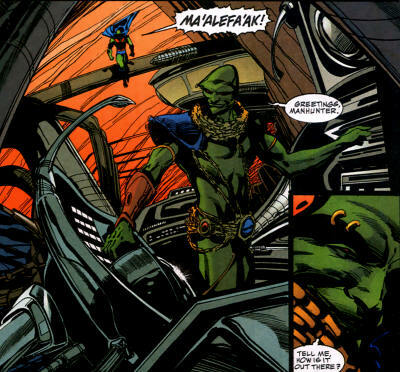 As the Martian Manhunter fled in a spaceship, Ma'alefa'ak finally confirmed his presence through a radio broadcast, as well as revealing his newly adopted anglicized name Malefic. Ma'alefa'ak had booby-trapped his brother's craft, which exploded and crashed on the lunar surface. The JLA began questioning inconsistencies in Malefic's plot and the circumstances of their friend's seeming demise. Aggravated, Malefic decided to kill them all, and began assaulting them individually from concealment. The Flash, Big Barda, Plastic Man, and the Huntress were beaten in direct attacks, while others like Superman and Wonder Woman fell victim to Malefic's machinations. Unbeknownst to Malefic, J'Onn J'Onzz had devised an escape plan, and returned to Z'Onn Z'Orr. 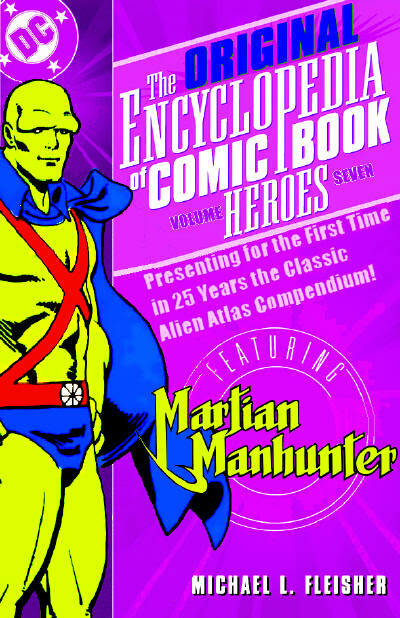 Activating the engines beneath the city, the Martian Manhunter flew it into space, then contacted Malefic electronically. Malefic teleported from the Watchtower to Z'Onn Z'Orr, destroying the mechanism en route to insure that his final battle with J'Onn would be private. In the conflict that followed, Malefic doubted his brother's willingness to employ lethal force. However, Z'Onn Z'Orr was already on a programmed course straight to the sun. J'Onn restored Ma'alefa'ak's telepathy just as the contingent vulnerability to fire was assured to cause his brother to self-immolate. Ma'alefa'ak perished from his own plague, while J'Onn narrowly escaped a second death of the day with the last minute assistance of Superman and Orion. Some time later, due to the ritual of G'amal'khul, the psychic remnant of Ma'alefa'ak yet living within J'Onn J'Onzz's mind managed to bury the similar portions of his brother's wife and daughter. 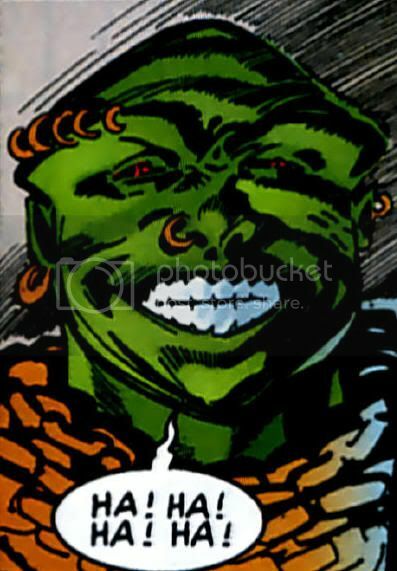 Ma'alefa'ak then tormented J'Onn with twisted false memories of his life on Earth, his own persistent mental manifestation, and urges to drive J'Onn to suicide. The gambit briefly succeeded in sublimating J'Onn's conscious self, allowing Ma'alefa'ak control of his physical body. 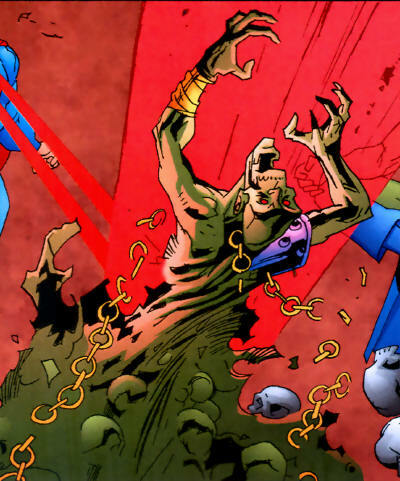 Ma'alefa'ak one again attacked the JLA, partially hoping that they would kill J'Onzz in self defense. Meanwhile, J'Onn finally relocated his wife and daughter within himself, who assisted him in reasserting his psyche. Coupled with the minds of the JLA, the Martian Manhunter obliterated Ma'alefa'ak on the psychic plane, ending his threat for good. 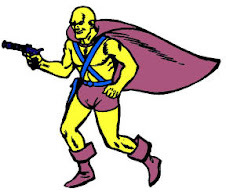 Like most Martians, Malefic was born with innate powers such as incredible strength, searing eye beams dubbed "Martian Vision," flight, invisibility, and the power to alter his shape, color and mass at will. When deprived of his telepathy, Malefic was also immune to the effects of H'ronmeer's Curse. Quote: "You knew nothing of me on Mars when I engineered the death of our race under your very nose! You understood nothing of me when I destroyed your new life on this joke of a planet! And you understand nothing of my life as I end yours by ripping you apart muscle by sinew!" Malefic so much potential but know writer has been creative enough to use him recently. Where did you find that first picture of him? 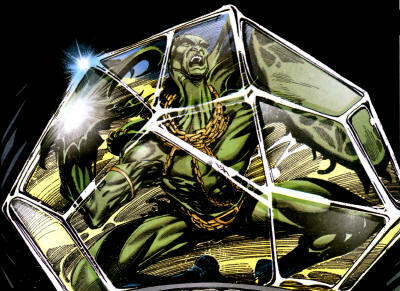 Ma'alefa'ak is in some ways one of the scariest of the villains of the DC Universe. Many villains wish conquest, others are content to kill individuals -- Ma'alefa'ak committed genocide on his entire species. If love and understanding of ohters are the hallmarks of J'Onn J'Onzz his brother's hallmark are hatred and intolerance of anything that differs from himself. I think the Malefic is one of the few villains who could legitimately scare Lex Luthor and the Joker. I agree with you 100% Will. Now only if some writer would use him. James, I believe the first image is from Martian Manhunter #35. It was the best full body shot with clear costume details that I could find. Most of Mandrake's pictures had him in some degree of shadow. Will, Malefic is a nasty one, and shares attributes of both Luthor and the Joker. He's a scientist, tech savvy and very manipulative, but he's also a cackling mass murdering sociopath who relishes psychological torture. Aside from powers, one of his primary differences in his enjoyment of physical torture as well, likely learned at the feet of DeSaad. I just never could get behind Malefic as a credible villain. I never could buy into his motivations or the prophecies or the "evil twin" aspect. It always felt just a bit too contrived to me. Though in the right hands, I think he could be a more powerful character. And if you have psychic visions of your son murdering your entire race, maybe naming him something that means "Darkness in the Heart" isn't the best way to go? You know, things like that tend to tip people over the edge. 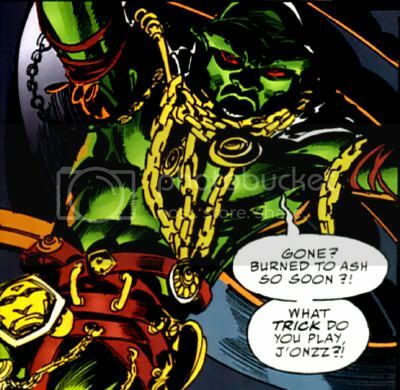 I think the point was to overplay Malefic's evil to insinuate the messianic goodness in J'Onn J'Onzz. I suppose that would make sense for a Superman type who is a Christ-like deliverer of divine assistance from a fallen heaven beyond the stars. 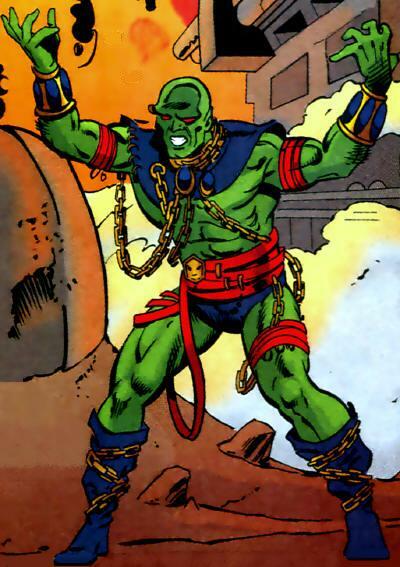 It has the opposite effect with the Martian Manhunter, compounding his personal failure and familial hubris to the point that the character is rendered an effectively impotent pariah who deserves the fear and loathing of Earthlings. After your always blatantly evil brother rapes your wife and lobotomizes your mother, you don't continue making excuses for him until he kills everyone you know. It's like a far right caricature of a deaf, dumb and blind bleeding heart liberal-- a particularly shrill political cartoon where J'Onn is bleating about prison reform while an ex-con is twisting the knife in his back. I have a mix of respect and horror that Ostrander's a democrat, but his writerly voice might as well be Sean Hannity. I'll clue you into how I keep my blood from boiling when I read Ostrander's run: not only was Ma'alefa'ak really T'Omm J'Onzz, but the entire 1998 series was told from his perspective. Malefic is how he sees himself, not necessarily either character's factual existence. That piece of his soul stuck in J'Onn's psyche just twists everything around. I need stuff like that, because I have to accept Malefic. He's been built up as J'Onn's nemesis for over a decade, other writers have *gasp* actually used him, and he's the first true Martian Manhunter-exclusive villain to reach animation (and is being sold that way!) My consolation is that his Injustice League is clearly the second string rogues. It isn't Luthor, Joker, Ares, Sinestro, and Professor Zoom, after all. Go Team Blanx! Barely any writers have used Malefic since. His most recent one to my knowledge (and i very well could be wrong here) is the Brave and the Bold where he appeared as a white martian general. Also Malefic is appearing in an animated series? So far, it's just been Ostrander, Justin Gray, Jimmy Palmiotti, and Landry Q. Walker. I suppose we can now count Dwayne McDuffie, who wrote the screenplay before his death. 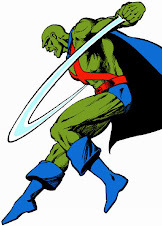 Animation means that every writer who takes a turn with the Martian Manhunter will connect him to Malefic from now on, the same way Aquaman always fights Manta or Wonder Woman and Cheetah. There's an immortality to it.